If you’re visiting Estes Park, we won’t be surprised to hear you’ll be venturing into Rocky Mountain National Park. And don’t worry, you’ll find tips on our guide for that, too! But this impressive park isn’t the only thing to do in and around the village. In fact, it’s only one of 20 items on this list. Keep reading to plan out your full itinerary in Estes Park, from the historic tours and jaw-dropping views to the llama pack trips and donuts. And if you’re staying overnight in the area, check out 15 Stunning Lodge and Cabin Vacation Rentals Near Estes Park and 10 Unique Getaways Near Estes Park and Rocky Mountain National Park (which includes a tree house!). 1. Attend an event at Estes Park Events Complex. The little mountain town of Estes Park celebrates every single season from Elk Fest in the fall to the Wine and Chocolate Festival in the winter, then the Whiskey Warm Up in the spring is followed by the Rooftop Rodeo in the summer. To see all events at all venues in the Estes Park Events Complex, click here. 2. 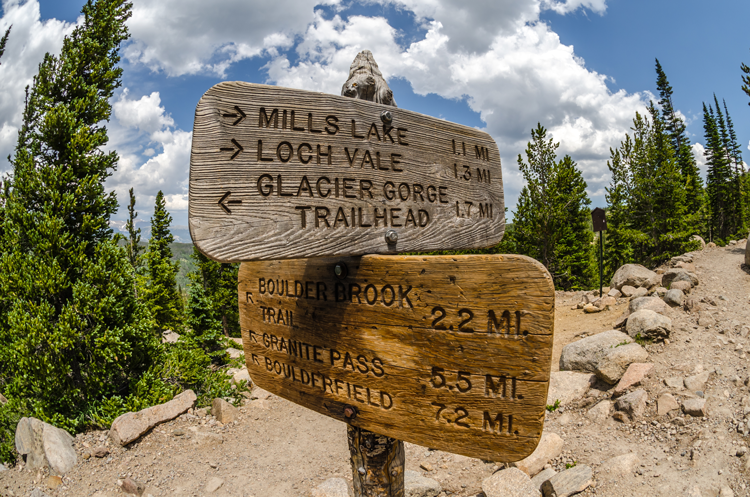 Explore Rocky Mountain National Park. Rocky Mountain National Park is the most popular outdoor recreation destination in Northern Colorado for tourists and locals alike. It spans 415 square miles, offers both drives and hikes, 300 miles of hiking trails, native wildlife like elk, bad eagles and bighorn sheep, winter activities, wilderness camping, and more. To begin your explorations, we recommend The 9 Best Hikes in Rocky Mountain National Park to See Fall Colors and The 10 Best Hiking Trails Near Estes Park, Colorado. 3. Embark on a Llama Pack Trip with Kirks Mountain Adventures. Kirks Mountain Adventures is a family owned and operated mountain adventure company that can guide everything from day hikes and fly fishing trips to snowshoeing trips and even llama pack trips with real llamas! To see all their offerings, click here. 4. Walk around Lake Estes. Lake Estes is a reservoir on the Big Thompson River. Its 185 acres of surface area and shoreline of about four miles offers a great opportunity for outdoor adventure in the heart of town. Through the seasonal Lake Estes Marina, you can even rent everything from one-person kayaks to 10-person pontoon boats. 5. Get a donut at The Donut Haus. Operating out of a Phillips 66 gas station more than 50 years ago, German immigrant Dieter d’Alquen developed The Donut Haus’ original recipes which are still in use today. The current owners, Karen, Diane and Katy, purchased the historic (and mouth-watering) business in 2008 and have kept it as authentic as possible. Their menu includes all the classics like buttermilk cake donuts, cream-filled donuts and delicious donut bars, in addition to sticky buns, fried cinnamon rolls and the Cheesecake Roll, a lightly fried butter roll topped with fresh cheesecake and cinnamon! 6. Grab a drink at Kind Coffee. 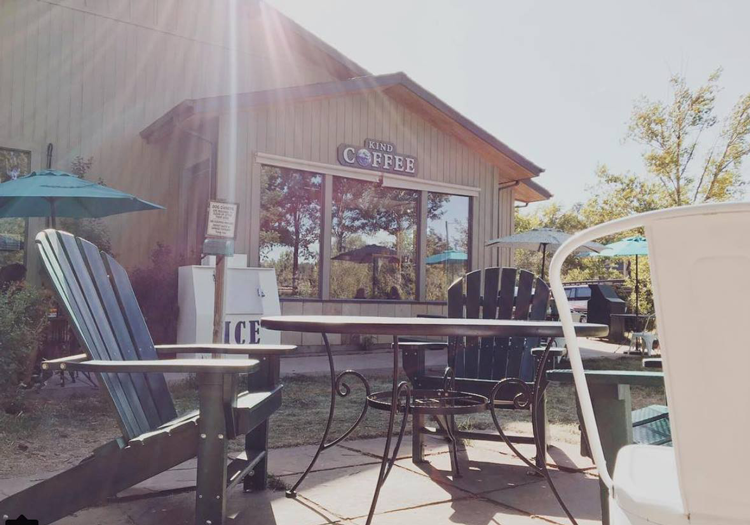 Featured in our guide, The Best Coffee Roasters Based in Northern Colorado, Kind Coffee began in 1998 as Estes Park Coffee Company, a small coffee shop where the team produced beans roasted in-house using a small, five-pound roaster. When they outgrew that roaster, they moved to a bigger space and adopted a name that epitomized their community-friendly, environmentally-friendly and farmer-friendly practices. The floors in the coffee shop are even made out of bamboo, a renewable resource! 7. Tour the Stanley Hotel. The Stanley Hotel is much more than just a luxury hotel. In addition to its historic rooms, legendary grounds overlooking Rocky Mountain National Park and destination dining services, its storied and haunted past reaches back more than 100 years and has made it one of the most famous hotels in the country. This is thanks in large part to Stephen King who modeled his book The Shining and its haunted Overlook Hotel after The Stanley. Activities inside the real hotel include a spooky Night Spirit Tour, which explores the phenomena and folklore surrounding the building and the grounds. In addition to the stories, the possible haunts and the luxuries available at The Stanley Hotel, guests can enjoy the hotel’s partnership with Kent Mountain Adventures Center to do everything from adventure hikes to ice climbing. They can also enjoy the brand new, $10 million events center called The Pavilion at The Stanley and Stanley Live, which is an exciting concert series that has brought musicians like Rick Springfield and Big Bad Voodoo Daddy to Estes Park. 8. Adventure at Open Air Adventure Park. The only park of its kind in the area, Open Air Adventure Park is an aerial adventure park that puts you anywhere from 10 to 21 feet above the ground. Up in the air in harnesses and climbing on ropes, you have 90 minutes to explore 32 different elements which range from easy green to hard black. This attraction is seasonal and you can get more information here. 9. Sip whisky at Elkins Distilling Co. When Elkins officially opened on July 4, 2016, they became the first legal distillery in the town of Estes Park. And ever since, they’ve been earning medals, awards and accolades for their spirits. Stop in the tasting room to find out why! 10. Rent with Backbone Adventures. Backbone Adventures is a family-owned business here in Estes Park and offers the perfect opportunity to explore the Rocky Mountains at your own pace. 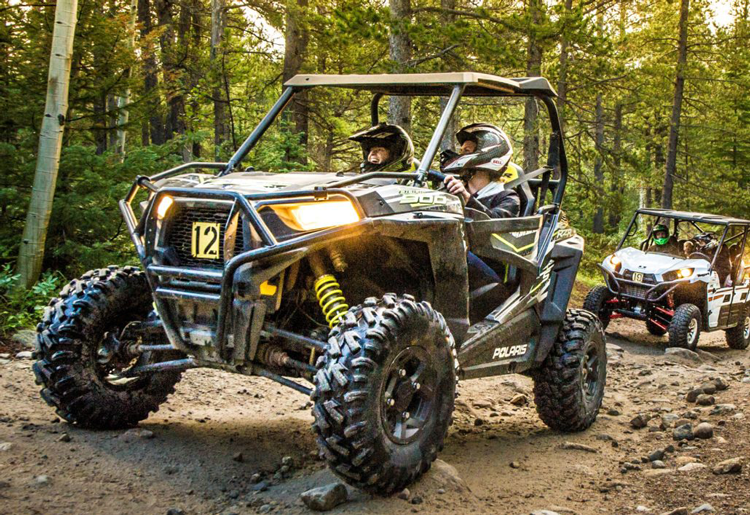 Complete with rentals, lessons and safety equipment, you can embark on unguided ATV and UTV, Jeep, snowmobile, and dirt bike trips with rentals delivered right to the trail. 11. Shop at The Taffy Shop. In 1935, the Slack family opened The Taffy Shop and it has been a landmark of Estes Park ever since. In 2014, another local family took the reigns, as well as the original secret recipe, which has always been kept in a safe deposit box. The gourmet taffy is made by hand and from scratch right in the store where you can taste it and take some home. 12. Play at Fun City. A Northern Colorado destination for family fun, Fun City is a seasonal, outdoor entertainment facility complete with the iconic, rainbow giant slide, a bungee trampoline, miniature golf, bumper boats and bumper cars, go-karts, and more. 13. Ride with SK Horses. SK Horses operates two seasonal stables in Estes Park. Cowpoke Corner Corral is located just three miles from downtown Estes Park at the edge of Roosevelt National Forest, and National Park Gateway Stables is located at the edge of Rocky Mountain National Park. 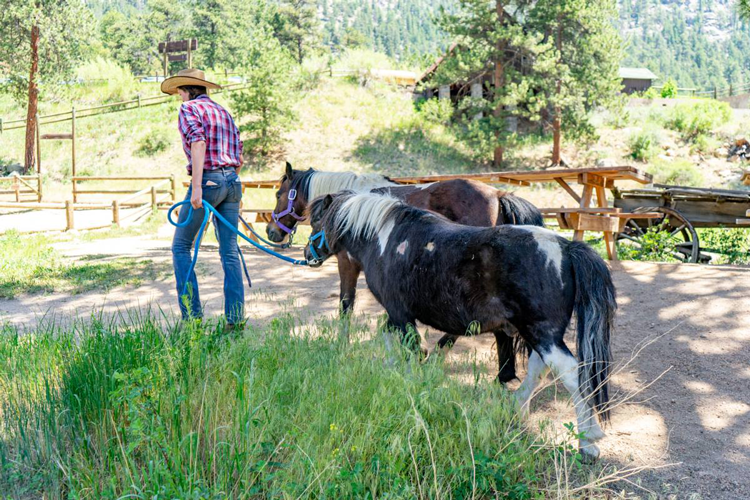 Each one offers various options for warm weather rides through the surrounding wilderness, from pony rides for kids and one-hour group rides to full day rides that climb all the way up to Ypsilon Lake. 14. Drink beer at Estes Park Brewery. In the Estes Park Brewery restaurant and taproom, you’ll find more than 12 fresh, handcrafted beers on tap, homemade root beer, a scenic overlook, pool tables and video games, a beer garden, and delicious pub-inspired food to complement it all. If you want to embark on your own Estes Park brewery crawl, stop by Lumpy Ridge Brewing Co. and Rock Cut Brewing Co., too! 15. Read at Macdonald Bookshop. One of several amazing local shops available in downtown Estes Park, Macdonald Bookshop is the headquarters for book lovers, and it has been since opening in 1928. Always family owned, this shop carries the latest bestsellers alongside Rocky Mountain regional books and featured local authors. To find more places to shop in Estes Park, check out Visit Estes Park’s shopping guide here. 16. Take a tour with Green Jeep Tours. 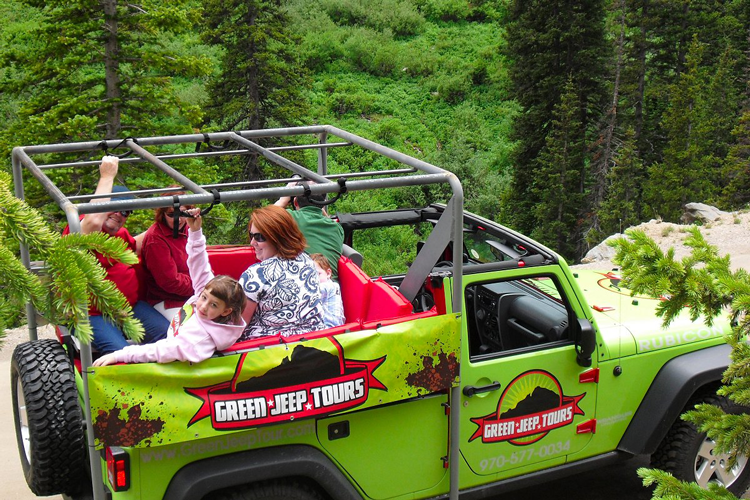 Based right here in Estes Park, the Green Jeep Tours team uses their famous bright green jeeps to take guests on off-road wilderness adventures, elk viewing tours, hiking tours, brewery tours and so much more. Available throughout the year, you can explore all their options here. Estes Ark might be one of the most unique shopping destinations in the state and its located right off Highway 34 in Estes Park. The building itself was built in 1994 and is shaped like Noah’s Ark. Inside, you’ll find an extensive stuffed animal collection, books, games, toys and a slot car racetrack. 18. Sip wine at Snowy Peaks Winery. In the Snowy Peaks tasting room, you can enjoy samples of their award-winning, handcrafted wines as well as select wines from some of Colorado’s best boutique wineries. It costs just $8 for samples of five wines and each Snowy Peaks selection is made from grapes grown here in Colorado! For more information on the food menu, the kids’ playroom and more, click here. 19. Climb at Estes Park Mountain Shop. Estes Park Mountain Shop is an adventurer’s paradise in every season. In addition to offering a huge retail shop of outdoor gear, you can rent gear, sign up for guided snowshoe trips and even rock climb indoors at their climbing gym. The gym offers 4,500 square feet of terrain, including a 600 square foot bouldering wall! 20. See Estes Park Museum. Estes Park Museum explores the history of Estes Park and Rocky Mountain National Park through exhibits on local wildlife, vintage vehicles, historic natural disasters, old pioneers and so much more. What’s your favorite thing to do in Estes Park?